Bush House opened on 4 July 1925. In 1929, it was described as the "most expensive building in the world." A product of Bush's hopes for increased international trade during the Roaring Twenties, the building lost financial tenants in the Dirty Thirties. Bush House also began with some older lore: a Roman head (either dating to Roman times or a much later copy) was excavated under the southeast wing in 1930 (see it here) and the basement is said to be haunted by a female ghost. The World Service operated from this location over the past 70 odd years, starting in 1940-41 after its earlier headquarters was bombed during World War II. At the time, it was called the BBC Empire Service, offering radio broadcast around the world on shortwave. George Orwell joined the Eastern Service there in 1941. In Orwell's famous 1949 novel, Nineteen Eighty-Four, the interior of the Ministry of Truth, according to the BBC, is partly based on Bush House, while the exterior is based on Senate House. 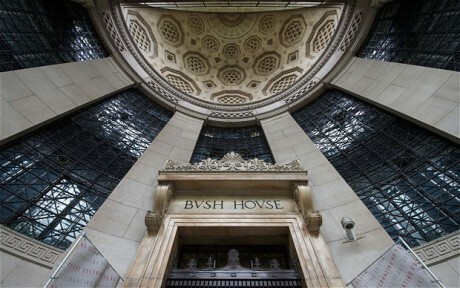 At Bush House, the World Service saw the ups and downs of news in the second half of the 20th century and early Millennium. In 1972, broadcasters read the news in 40 languages. The BBC World Service famously addressed the Eastern Bloc throughout the Cold War. In 1978, Georgi Markov, who worked as a journalist at Bush House for the Bulgarian BBC Service, was stabbed with a poisoned umbrella and returned to work after the incident, not realizing anything was wrong. He died three days later. The incident may have inspired the name of two 1982 DC comics characters (see my related post on Brion and Tara Markov, here). You can see an employee's video, posted this week here, with some photos of interiors; the last 'Focus on Africa' broadcast from the point of view of the employees, here; last World Briefing broadcast from Bush House, also from the perspective of the employees this week; and 12 July 2012's last broadcast included a reminiscence about the building. There is a selection of the World Service's introductory music, here, including the tune Lilliburlero, which it sometimes uses and which was composed by Henry Purcell in 1689. When I began my (now sorely neglected) Christmas music blog, the first selection I wrote about was King George V's 1932 Message to the Empire, intended to instill faith in the fledgeling technology. Even though the hardware has periodically been updated the organization itself really seems to come from another age, simultaneously condescending and magnanimous (the original idea, to distinguish it from the domestic "Home Service", was to call it the oxymoronic "Empire Service"). If any of your readers reside in countries that are officially independent of the United Kingdom but have access to BBC World Service, it would be valuable to hear from them to know what it means in their day-to-day lives. Always glad to see you here. I fall under your category (residing in a country now officially independent from the United Kingdom, but have access...). I would say that the World Service was important in Canada in WWII. It's hard to remember that pre-internet, a global-reaching media organization was not the norm. I had Cdn friends and relatives who had short wave radios who listened to it daily up through the 1990s. I think you're right that these old broadcasts make more sense in their own time and place. But world affairs have a way of making them relevant again. Like the Great Depression, which seemed an unimaginable one-off lost in history, the recent recession gave a taster of how everything can be lost incredibly quickly. The BBC World Service really jumps to the forefront of the imagination in times of conflict and crisis. In the Empire during WWII - it was the instrument that made Churchill's speeches so legendary. But later, the World Service was important post-imperially and outside the Commonwealth in Eastern Europe, the Middle East, Africa, in some formerly British territories, and in non-British territories. The important point is the global view the Brits took - a move that we can say was (a) very forward thinking and clever (b) not outdated now by any means. It was a very modern decision to broadcast one's own take on the news worldwide in English and in local languages other than English; there really was and is no other global broadcaster that comes close, even today. Of course, the World Service might serve as a tool of propaganda and espionage. Officially, it is supposed to be impartial (beacon of free speech), but it has a British establishment angle. All the same, that angle, while historically problematic, can be better than the alternatives. Thus, one does not realize the Service's importance (and continued relevance), whether one is post-colonial or not, unless TSHTF, so to speak. I mean the kind of scenario imagined in the Terminator series, where radio becomes the only means of general broadcasting again. I suppose if total war returned, or the economy completely collapsed, or one lived in a police state where the government or corporations or gangs or thugs controlled the media totally, or we were forced to live under circumstances in which TVs and the internet were no longer available - we might see the World Service once again as Aung San Suu Kyi does. And there is a piece in the Guardian worrying that the move from Bush House signifies a shift from the much more independently minded World Service outlook to the domestic BBC - which is a very different animal. The standards of global media are often much higher than that of domestic media. To take an American example, there is no comparison between CNN International, which is broadcast on TV abroad, and CNN domestic, which is played in the USA and Canada on cable and satellite. CNN International's reporting is of much, much higher quality. Actually, as an American I get about an hour of the World Service through National Public Radio in the morning (more if I happen to be up at 3AM). Their field reporters are indispensable. Their anchors are another story. I only wish that US broadcasters still sent reporters to the physical locations where stories take place. Somewhere in their cost analysis approach to news production one of their actuaries should point out to them that while it may indeed be cheaper to produce something worthless that will only be advantageous as long as people are willing to believe that their own time spent watching it is worthless as well. Listening to a decades old BBC broadcast is as clear and precise an experience as reading a sober history text. I pity researchers of the future wading through the celebrity gynecological updates that pass for news reports on US television, trying to find a perspective that wasn't paid for by the subjects of the story. It is astonishing how much of television news is actually prepackaged advertising delivered to the stations who then uncritically pass it on to the public, often unedited, as though it was a result of their reporting. That it happens at all is criminal; that it has become the standard business model is obscene. If a BBC reporter is walking through the streets of Kabul with their microphone on, I hear Kabul. I do not hear a want-to-be pundit bloviating about Kabul. I don't want to minimize the Guardian's concerns, but I've read around spin my entire life. If someone presents raw information from its source and then adds a biased analysis, I am not so naive that I can't distinguish fact from analysis. If anything, the biased analysis is the first hint as to what, if any, factual information is consciously omitted. On the other hand, if an unbiased source has honestly overlooked some detail, we may never know and it may never occur to us to look further. "Celebrity gynecological updates that pass as news reports," LOL, that's pretty good. I agree about reading around spin. It's not just in journalism. It's everywhere. On the Internet, spin is often indistinguishable from fact. As for news reports specifically, I am so tired of everyone having some axe to grind, some angle to toss in. Just give me the facts. That is a bit Grandgrindian. But when all you get is spin, you start to yearn for what you call raw information. At one point, the BBC World Service was supposed to offer that.